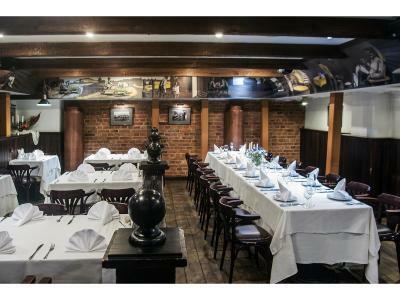 Lock in a great price for Kaunas – rated 8.6 by recent guests! Clean rooms, great view from the top-floor window, friendly staff. Rooms and location, price was good, parking place for a car. Our reservation was upgraded to an executive suite, surprise, so our stay was exceptional! Good location, good breakfast, good value for money, free parking. Nice reception staff willing to help the customers with their requests. I will stay again at this hotel in my trips from Tallinn to Krakow. Clean, very comfortable, value for money and excellent staff (especially Ema on reception). The hotel is in a perfect location. Our room was on the highest floor and it had a great view. Staff was friendly and helpful. Hotel also had a proper gym. World’s largest delicious breakfast in cute restaurant. The staff was exceptionally friendly and helpful. The staff was attentive. The facility is dated but works. The seating area on the pedestrian street in front of the hotel was wonderful on the warm days, felt like being a part of the life of the city. Room and bed were comfortable and the high ceilings were a bonus. Quiet too. Kaunas This rating is a reflection of how the property compares to the industry standard when it comes to price, facilities and services available. It's based on a self-evaluation by the property. Use this rating to help choose your stay! One of our top picks in Kaunas.Located in the center of Kaunas, this 4-star Superior hotel is located directly on Laisvės Alėja. It features an indoor pool and air-conditioned rooms with free Wi-Fi and mineral water. Free private parking is available. The rooms of the Hotel Kaunas are spacious and feature a classic interior design. All have a work desk, satellite TV, mini-bar and refrigerator. Some rooms have a balcony. The Old Town is 2,650 feet from the Kaunas. The Kaunas State Musical Theater is 1,500 feet away, and the Museum of Zoology is within 1,000 feet. The large fitness center at the Kaunas features Technogym equipment. A sauna is available for guests to relax in. There is also a safebox, a fax and a conference room. It also offers such services as shoe shine and airport shuttle. Lithuanian and international cuisine is served at the restaurant 55. A coffee bar and 24-hour room service are also available. 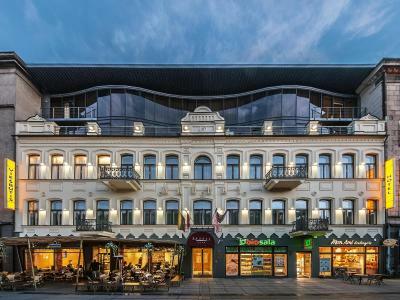 When would you like to stay at Kaunas? Features satellite TV and a mini-bar, as well as a bathroom. Some rooms include views of Laisvės Avenue. Some feature air-conditioning, a balcony or a terrace. Please note that all Special Requests are subject to availability and need to be requested in advance. Please note that the property lies on the pedestrian only street. The parking is located on 15 Maironio Street. Spacious suite with a separate living room, includes slippers and a bathrobe. Ironing facilities available at request. These rooms feature views of Laisvės alėja, a trouser press, bathrobe and slippers. Some come with a balcony. Balcony is featured in certain rooms. Air-conditioned room with a bathroom, as well as satellite TV. Balcony and views of the Laisvės alėja are featured in certain rooms. These are two interconnected double or twin rooms. The bathroom features a hairdryer and free toiletries. A room with a bathroom as well as satellite TV. Some feature air-conditioning. Ironing facilities available at request. The only 4 star plus hotel located on the main pedestrian street - Laisves avenue with unique restaurant - 55 degrees. Many customers assessed as the best breakfast offering hotel with a renovation carried out in 2015 and unlimited speed wifi. House Rules Kaunas takes special requests – add in the next step! Kaunas accepts these cards and reserves the right to temporarily hold an amount prior to arrival. Please inform Kaunas of your expected arrival time in advance. You can use the Special Requests box when booking, or contact the property directly using the contact details in your confirmation. Room was a little bit cold. Reception was really nice. I like the location of the hotel. Food in the restaurant was really good. Was traveling for surgery and hotel staff really looked after me post op. The quality for breakfast was not good with a lot of choices but food was not fresh. The gym was small with old machines and the pool was very small. For a 4 stars, the bathroom was too basic. Room and bathroom are slightly tired looking for a hotel of this stature. Excellent location! The breakfast was lavish, with everything you'd ever want. The sauna and small swimming pool were nice. I would have love some american pancakes , but that`s just me, breakfast was good. Location is perfect , in the center of the city . The reception was amazing, we asked if it possible to take the room around 12:00 and they made it happen, amazing . The room was spacious, clean , we had everything we needed and a view of the buildings in the city center. Breakfast was good , coffee was good . It was a wonderful stay, I recommend it to everyone. Friendly, central, really impressive shared balcony and excellent breakfast. Food in hotel was very good and great value. Our room was fabulous. Location couldn't have been better. It was right on the main pedestrian area. Just beautiful. Location is great. It is just walking distance to the old town. It was quiet in the room.